Great for P.E. & Field Day activities! Similar to horseshoes in scoring and play formats, these games can be played indoors or out. Each set includes one 10” flying disc, one 5” Mikasa® playground ball, two scoring containers, and two Activity Guides. 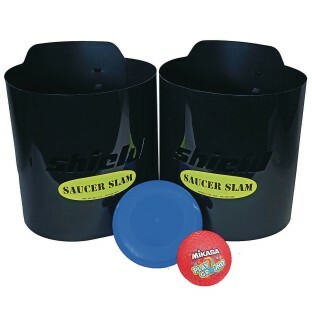 The 12-page Saucer Slam guide includes 8 game ideas and the 12-page Ball Slam guide also has 8 game ideas. The guides were written by Curt Hinson, a Ph. D. with over 32 years of teaching experience at both the elementary and college level, plus a well know author within the P.E. community. The games include activities for 2 to 32 players! Made in USA.